Don’t let flooding completely ruin your home. The longer a flooded home is left sitting, the more the damage will increase in no time. That’s why it is important to start moving as quickly as possible to minimize the damage and expedite the restoration process. Whether a flood has been caused by groundwater, falling water, or a home water system malfunctioning, you need to make initial steps to prevent further damage. However, even if you want to go back to your house as soon as possible, rushing will only lead to a worse situation to make sure to take step by step actions and fix the damage without missing a single thing. Here’s how to deal with flooding at home. Safety comes first. So if the flood was that bad, do not attempt to enter your home until it is safe to do so. Before you start cleaning up or remove the water, fully document the damage for your insurer by taking pictures. Cleaning up before taking photos might decrease the extent of your coverage. Calling your insurance company is a must as soon as possible. The insurance company must send out a water remediation specialist to help you immediately. It’s a good idea to go to your fuse box and turn off the main and all of the individual connections even if the power isn’t operational. This way, you’re not at risk for mixing standing water and electricity even if the power is reactivated. 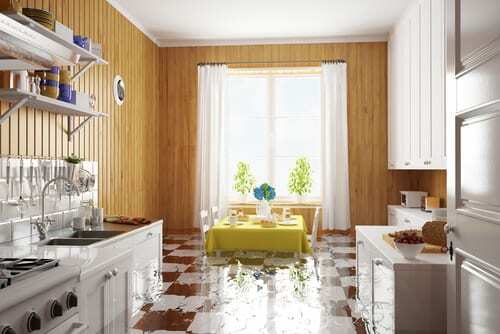 The longer the water damage sits there, the more damage it will cause. So open the doors and windows to allow fresh air to circulate and use a sump pump to remove water. Remove wet carpets and beddings as they may also cause molds.